If your goal is to become an Honor Graduate when you graduate from the U.S. Marine Corps, you must be well prepared for what lies in front of you during USMC Boot Camp. It means you should have a solid foundation of running, rucking (walking fast with a backpack), and strength/muscle stamina from at least a year’s worth of lifting weights and calisthenics. Graduating with honors requires more than being physically prepared, you must also display a never quit attitude, motivation, be a strong team player, ingenuity, and obviously a very strong work ethic. Read books about the Marine Corps. The USMC has a reading list each year for its Marines and Officers to read to become smarter and more effective members of the Marine Corps. Learn to wake up early and be disciplined about exercise in the morning, so it is a habit that you excel in as it will help you adjust to the USMC schedule of the day. Do not strive for the minimum standards. Being the best at something means you should strive to score the maximum possible points in every fitness event you do, be first or at least the top 5% in runs, rucks, obstacle courses, land navigation, and even shooting. 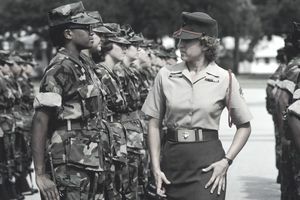 But most importantly, being a team player and helping your fellow Marine recruits with any weaknesses they have – especially if it is one of your strengths. In Marine recruit training, there is hardly any time to prepare for what is being experienced, unless preparation begins before recruit training. Lance Cpl. Dane E. Childs, Platoon 2078, Company E, a 19-year-old native of Springdale, Ark., attributes his success in recruit training to preparing for it an entire year before shipping to Marine Corps Recruit Depot, San Diego. "He was prepared to go into recruit training," said Denton Childs, his father. "He worked out every day, read books, and knew what to expect." In addition to knowing what he was getting into, Childs knew why he was getting into it. He always wanted to be the best of the best, and that is why he chose the Marine Corps over the other services, according to Denton. "In everything I do, I want to do my best," said Childs. "That is why I didn't join the Navy or the Army." "He wanted as much of a challenge as he could get," said Denton. With the challenge of recruit training in his sights, Childs knew the Marine Corps wouldn't be easy, according to Nereida Childs, his mother. He worked out, building himself physically and made a healthy diet high on his list of priorities. His recruiters and fellow poolees in the Delayed Entry Program gave him the name "Turbo" for the amount of crunches he could pump out at the initial strength tests. According to Childs, he could do about 110-120 crunches in two minutes compared to his 167 crunches now. The positive physical payoff of Childs' hard work prior to and during recruit training can be seen in his increase from 23 pull-ups to 29 pull-ups and the decrease in his three-mile run time from 22 minutes to 20 minutes. Childs felt he was a weak swimmer, but applied his "be the best" attitude and ended up becoming a first-class swimmer, one of only three out of his 54-man platoon. Childs excelled on the rifle range as well, scoring 237 out of 250 qualifying as an expert rifleman, even though he had never shot a rifle before. "He always worked harder than everyone in sports," said his father. "He did it harder and got better than everyone." On top of always striving to be the best, Childs has always helped others who were falling behind and stuck up for the underdog, according to his mother. It was displayed in recruit training by his ability to make his platoon work together to get the missions accomplished. "I was put as guide for my pull-ups, and then I grew from there," he said. "I learned things and made the recruits work as a team." Childs said he displays his leadership through his bearing and the example he sets. "I believe in giving 100 percent at all times," he said. "Even though it is not always easy." It is a continuous cycle for this new Marine to look for tough challenges and complete them before moving on to the next. "I give until I know I can't get any better or give more," said Childs. Childs said he dreams of living in San Diego on the beach with financial stability and a beautiful wife. His family and girlfriend visit him at graduation today as he crosses the parade deck one last time, ending his recruit training and earning the title, Marine. Stew Smith is a former Navy SEAL and fitness author certified as a Strength and Conditioning Specialist (CSCS) with the National Strength and Conditioning Association.